So, what do you get out of your park? Upper Noe Rec Center is the heart of our neighborhood, the meeting place where neighbors mix casually, forming the bonds that make our community stronger, safer and more interesting. It adds beauty and brings life to a quiet section of town. What makes it tick and how can you join in the fun? Friends of Noe Valley Rec Center (FNVRC) has been working for our community since 2005, planning and caring for the rec center, and making sure neighbors are informed of programming and involved in it. It all started with Alexandra Torre who, along with co-chair Molly Sterkel, did a marvelous job of ushering us through the renovation of 2007-08. Kate Haug joined the group in 2010 and became co-chair with Molly when Alexandra stepped down. For the past three years, the Friends have organized the newsletter, published the website and its monthly updates, planted the Sanchez side with native plants, and sponsored tot concerts, school fairs, movie nights, a swing dance and other free public events. FNVRC has become a network of action-takers in various capacities and interests, united in a spirit of good will. Friends can be found leading volunteer efforts to maintain and beautify the gardens and facilities, writing and publishing public information, conferring with Rec and Park managers, organizing and hosting events, and watching over park security. The group finds compromise among the various park users and steers programs to serve the needs of our demographic. In 2011, FNVRC received the Volunteers of the Year Award from the Neighborhood Parks Council. The group is small but looking to expand and include more points of view. Do you have one of those? Come and see what we’re all about on Wednesday, April 24 at 7 p.m. at Upper Noe Rec Center, 295 Day Street. Contact chris@noevalleyreccenter.com or just stop by. One of our current goals is to host a community block party at the end of summer. What fun! 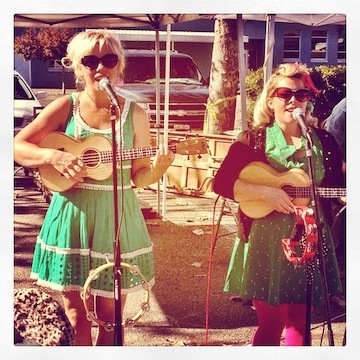 Check out the sweet harmonies of the ukulele-toting duo, The Paper Dolls, at our free tot concert Saturday, April 20, from 10 a.m. to noon. The show will be on the playground, weather permitting. Otherwise, it will be inside the auditorium. The pair have their own children’s tunes and sing cover songs as well. Listen to their music here. Peanut butter bones? Rice and egg pie? That might not appeal to you, but ask Bowser and he’ll bark for joy. On the fence about it? 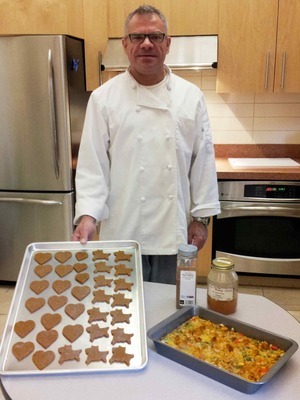 Check out Rutherford’s website to see the kind of tasty concoctions he makes for humans. Your dog is in for a treat! Express It!, the Tuesday and Thursday afternoon creative movement class for tots, has been cancelled for spring term. Attendance has long been sparse, owing to the afternoon time slot. Facility Coordinator Cheryl Woltjen said the class will move to mornings in the summer, a time that better suits the needs of that age group. 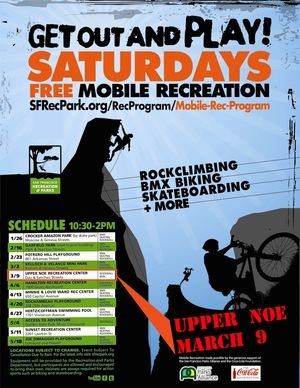 A huge crowd turned out for Upper Noe’s Mobile Rec Day on March 9. “The basketball court was full, there were people in the tennis courts, the dog run, and all four corners of the field,” said Facility Coordinator Cheryl Woltjen. The event drew more than just children wanting to hit the 30-foot climbing wall and BMX ramps. “It was a draw for kids to come to the park and bring their wheels,” she said. Though the department owns the equipment, the cost of staffing mobile rec days is being funded by a grant from the Coca Cola Foundation. Hopefully the department will apply again! 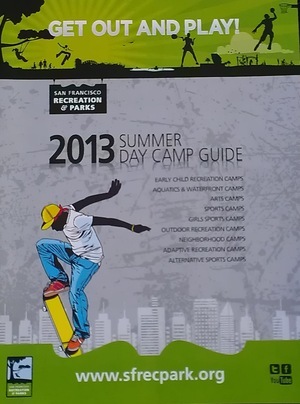 Thanks to all 8,000 people who registered for summer camps March 16. Popular options, like the week-away camp at Camp Mather, filled quickly. Rec centers were crowded at 10 a.m. when registration opened, and many had to wait longer than an hour to enroll. Registration at Upper Noe was slow partly because printed camp instructions came with each receipt. That practice is expected to change for next year. Upper Noe offers two types of tennis classes---QuickStart Junior Tennis Academy and those taught by USPTA/PTR certified tennis professionals---but interested players should choose based solely on age and time, said Lou Maunupau, Recreation Coordinator for the department’s tennis program. All the options at Upper Noe are about the same: entry level and a little better, he said. The classes for younger children make use of the modified gear that characterizes the QuickStart format (designed by the United States Tennis Association), like smaller rackets, larger, softer balls and smaller nets for younger players. Okay, but let’s say you have a group of kids or adults who are intermediate players, but you don’t want to drive across town for the department’s more advanced tennis classes in Golden Gate Park and Julius Khan. Maunupau said he might be able to create classes to fit the need. “I’m always looking to find places where programming is realistic and will work,” he said. To see a list of all classes offered at Upper Noe, including tennis, please visit the Daily Schedule page of our website. Tennis students should have their own rackets, but the department does have a limited supply to lend if needed. Contact Maunupau with questions or equipment needs. His phone rings “off the hook,” but he tries to answer each message. Email him at lou.maunupau@sfgov.org or text or call 415-244-8921. The recent rainy season didn't live up to its name and the surface in Joby's Run was often dry as a bone. Recent showers have helped settle the dust and keep the space sanitary. 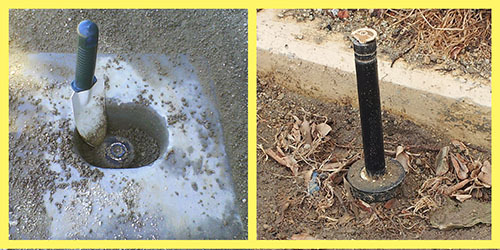 However, the sprinklers have yet to receive promised maintenance to adjust and/or replace sprinkler heads. It's a harsh environment and it's been five years since they were installed beneath the gravel surface. Now, many don't throw water at all or concentrate it in muddy patches and puddles while leaving great swaths dry. We've been barking about it. Is anyone listening? Agenda: 1. Isabel Wade, founding president of Friends of the Urban Forest, encourages growing lemons (fostering community resilience through fruit tree production). 2. Supervisor Campos, someone from the Mayor’s office and a rep from CPMC discuss the new St. Luke's Hospital plan. The Paper Dolls grab their ukeleles and get the little ones dancing. All you can eat pancake, sausage, fruit, milk, juice, coffee and tea. $10 for adults, $5 for children. HMP funds are applied toward many different park improvements and amenities, like kiosks, BBQs, benches, trash cans, mosaic tile, landscaping, irrigation and more. Organized by the Help McClaren Park group, www.helpmlpark.weebly.com.